From where do we learn from the Torah that changing one’s clothes is a sign of respect? The verse from Yeshaya 58:13 was already expounded to teach, among other things, that one’s Shabbos clothes should not be like one’s weekday garments (113a). Nevertheless, Rabbi Yochanan is quoted trying to show that this concept is indicated not only from a verse in the prophets, but that it is also rooted in the Torah. Ben Ish Chai explains that based upon this verse from the Torah, there is a practical difference which can be derived regarding the need to wear special clothing on Shabbos. I’ve been pondering a few things lately regarding Judaism and particularly the Messianic sect of Judaism which recognizes Yeshua (Jesus) as the Moshiach (Christ). There are many things about Judaism that I find beautiful and I find myself sometimes drawn to those traditions. In the days when I used to worship on Shabbos and pray while wearing a tallit gadol, there was a “specialness” about it I can’t articulate. Weekday mornings when I would pray shacharit while wearing a tallit and laying tefillin had a texture and a quality about them that I can’t describe. The blessings I recited from the Siddur (which are taken from Hosea 2:21-22 in the Tanakh or verses 19-20 in Christian Bibles) when donning the arm tallit, invoked a particular unity between me and my God that I think Christians miss some of the time. I will betroth you to Me forever; and I will betroth you to Me with righteousness, with justice, with kindness, and with mercy; and I will betroth you to Me with fidelity, and you will know Hashem. Christians sometimes criticize Jews for all their “man-made traditions” but there is a certain beauty in how observant Jews even prepare themselves for encountering God in prayer. After all, if you were summoned to appear before an earthly ruler, such as a King or President, you would certainly prepare yourself, including dressing for the occasion. Why shouldn’t the same be true if we are summoned to appear before the Ultimate King: God? 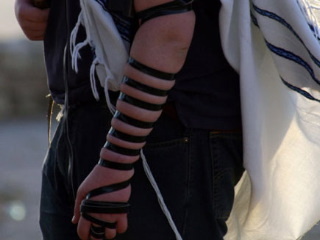 And after all, Jews are indeed commanded to wear tzitzit (Deuteronomy 22:12) and to, in some sense, wear the Torah (Deuteronomy 6:8). Hear, O Israel! The Lord is our God, the Lord alone. You shall love the Lord your God with all your heart and with all your soul and with all your might. Take to heart these instructions with which I charge you this day. Impress them upon your children. Recite them when you stay at home and when you are away, when you lie down and when you get up. Bind them as a sign on your hand and let them serve as a symbol on your forehead; inscribe them on the doorposts of your house and on your gates. But as my conversation with Pastor Randy reminded me the other day, there are also commandments and rulings that are beyond my comprehension. All holy writings may be saved from a fire. Perek teaches the laws of saving items from being burned in a fire on Shabbos. 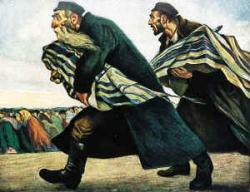 On the one hand, our sages realized that if a person is given an unlimited license to save everything he can possibly grab, the person would invariably be driven to try to extinguish the flames, which is a Torah violation… This is why the halachah put a finite limit on what a person is allowed to salvage from a fire. Once this quota of clothing and food is met, the person may not remove anything more from the burning building, even if the particular situation allows the time and conditions to retrieve more. On the other hand, our sages were lenient to allow saving holy scrolls from a burning building. It is permitted to remove a Torah scroll, for example, to a domain which is normally rabbinically restricted. This is the topic which the first Mishnah discusses. might carry the items into the city himself. The Rishonim deal with this apparent inconsistent approach of the halachah to a Jewish person who is faced with a risk to his property. In the case of a fire we limit him although he is not doing any melachah, but when carrying into the city as Shabbos begins, we are lenient. For a Christian, the problems being posed here and their solutions do not appear on our “radar screens,” so to speak. It’s as if a difficulty was made up for the sake of proposing a solution. Yes, the Jewish people are commanded to observe the Shabbat and to keep it Holy (see Exodus 20:8, Exodus 31:15-17, and Deuteronomy 5:12), but all of the Rabbinic rulings that go along with these commandments are enormously complex, at least to me. How can one even begin to observe Shabbos and remember each and every condition and circumstance that could possibly apply in a flawless manner? But then again, I don’t live in the Orthodox Jewish space, so what do I know? I can only imagine that there are many, many Jews who are Shomer Shabbos. I know that after the local Chabad Rebbetzin gave birth to her youngest child on a Friday night, her husband, the Rabbi, walked from the hospital to the synagogue in the middle of the night (since it was Shabbos and he was forbidden to drive or to even accept a ride from another) so that he could be at shul to lead Shabbat services Saturday morning. I can’t imagine a Pastor ever being in a similar situation and from a Christian’s point of view, even if we had such a restriction, it is very likely that we would depend on the grace of Jesus and under unusual circumstances, overlook the commandment by allowing ourselves to drive or, in the case of a fire, retrieve any of our property we could lay our hands on before the fire could get to it (or to even put out the fire if we could). Do we admire such dedication to the commandments of God as they are understood in religious Judaism or do we consider observant Jewish people to be bound and gagged by the letter of the Law and also by the commentary on the letter of the Law? That’s a tough one. Even if we in the church disagree with how Jews choose to obey God, it’s their choice, not ours. But if those Jews are also Messianic, should we look at the mitzvot any differently? Should we allow ourselves to judge others because they are Jewish and they choose to live a religious Jewish lifestyle? I’m in no position to do any such thing, but it does bring forth interesting questions. There is not always a single tradition in religious Judaism as to how to perform the mitzvot because there isn’t a single Judaism. Further, there isn’t always agreement between the ancient or modern sages as to how to perform certain of the mitzvot, and so one much choose which tradition to follow, usually based on which Judaism you are operating within. Setting that aside for a moment, another problem presents itself, but it too is a man-made problem. I was recently criticized on another person’s blog about the questions I was bringing up as a result of last Wednesday evening’s conversation with Pastor Randy, but the criticism wasn’t coming from anyone Jewish. There is a certain corner of Christianity that believes we Christians are identical to the Jewish people once we come to faith in the Jewish Messiah, at least as far as the mitzvot are concerned…well, sort of. It’s complicated, but the core of their argument is that there is such a thing as a perfect Christianity/Judaism that can be divined solely from the Bible, and that it is possible to practice this very particular form of religion without any (or any excessive) human-created interpretation and set of attendant traditions, and using more than a little theological sleight of hand to “prove” their position. What’s really interesting is that my critic and his friends who have commented on the matter, didn’t seem to actually read what I’d written. I was asking questions, not making pronouncements, and yet they were actively condemning my “conclusions.” The one thing I can say with certainty though, is that I see no directive for modern Christians to mimic modern Jewish religious behavior in an attempt to worship as if we are in one of Paul’s first century churches or synagogues. I’m not here to criticize Jewish people or Jewish religious observance. I don’t have the right or the necessary qualifications to render a definitive commentary, only the drive to share my questions and thoughts on the matter, such as they are. I’m not even really criticizing how other Christians choose to view their religious obligations to God, except to the degree that they attempt to impose their personal viewpoints on other Christians and on observant Jews. To the best of my understanding (and I’m attempting to improve my understanding all of the time), no human being has the ability to perfectly obey God in every single detail, regardless of the religious tradition to which they belong. This was probably as true in the days of Moses, Solomon, and Elijah, as it was true in the days of Jesus and Paul, as indeed, it is true today. Pastor Randy suggested a very straightforward method of studying the Bible based on the three steps of observation, interpretation, and application. That requires some fluency in Biblical Hebrew and Greek, and lacking much ability in that linguistic arena, I’m already handicapped. This is why I speak with teachers who I respect to discuss and debate them on their insights. This is why I have so many questions. But in the end, the advice of another friend of mine must be at the heart of every question and lay the foundation for every answer. In the end, and in the beginning, we should not seek out Judaism or Christianity, but only an encounter with God. This is something that not only are we all capable of, regardless of who we are, but in fact, it is something that we are all commanded to do, because it is God’s greatest desire. Yeshua answered him, the first of all the mitzvot is: “Hear, O Yisra’el! HaShem is our God; HaShem is one. Love HaShem, your God, with all of your heart, with all of your soul, with all of your knowledge, and with all of your strength.” This is the first mitzvah. Now the second is similar to it: “Love your fellow as yourself.” There is no mitzvah greater than these. Love God and seek Him and, if you do love God, seek out your fellows and love them, too. But in the end, the advice of another friend of mine must be at the heart of every question and lay the foundation for every answer. In the end, and in the beginning, we should not seek out Judaism or Christianity, but only an encounter with God. For Jews, the tools for accomplishing this encounter reside in Judaism. Rav Yeshua commented about the need for even mundane things such as food and clothing, by suggesting first that HaShem takes care of the rest of creation so we shouldn’t worry, and then saying that we should seek first HaShem’s kingdom (i.e., malchut ha-shamayim) and everything else would fall into place. This statement appears in Matt.6:33, which is still part of the hillside sermon which included only shortly beforehand the statement that becoming great in this kingdom would be fostered by doing and teaching Torah in all its finest details (Matt.5:18-19). Hence, for Jews, one may not draw a dichotomy between seeking Judaism and seeking an encounter with HaShem. They are intrinsically bound up with one another. I cannot make a similar claim for Christians or Christianity, so your friend’s advice may be deemed valid in that framework, but only if he does not attempt to extend that view onto Judaism. It is this sort of error that has inhibited MJ from a full restoration into the Jewish community, and, indeed, has led to much harm to Jews from Christians over the centuries. It is a very small error, but it is pivotal and must be challenged whenever it arises. Non-sequitur — and antisemitic in the extreme if you are trying to imply that the entire Jewish community is “dead”. To whom then would you expect a proclamation of the kingdom if not to Jews? This text, wrenched from its context, it nought but a pretext for mischief. Shame! ProclaimLiberty, I believe that Yeshua exactly meant that the entire thing was dead and that is why his strength is made perfect in weakness. The only solution to death is Resurrection and that can only be obtained by following Yeshua as he is THE LIFE. Then you ignore Rav Yeshua’s clear teaching in Matt.5:18-20 that doing and teaching Torah, in its finest details, even more diligently than the scribes and Pharisees, is the means to become great in the kingdom of heaven. You are suffering from a lack of contextual understanding, and using it as an excuse to condemn. May HaShem protect us from such ignorant arrogance! I see this conversation took off while I was at church. First of all, let me say that I wrote this from a Gentile Christian point of view (obviously, since that’s who I am), so I can’t actually comment from a Jewish perspective. Secondly, today’s “meditation” is an extension of this blog post which was written in response to a conversation I had with my Pastor last Wednesday on these topics. Also, the final statement to seek God rather than Christianity or Judaism is specifically related to my personal experience and the direct result of a conversation I had with a friend over coffee several weeks ago. I know that it can be easy to mix up the “doing of religion” with actually seeking God. I think especially Gentiles within the Messianic and well as the Hebrew Roots (including One Law and Two-House) movements are vulnerable to this. I know that my own thoughts at times get caught up in the mechanics of worship and religion rather than the goal, and the goal for everyone is always God. I understand what you’re saying ProclaimLiberty, that for a observant Jewish person, seeking God always occurs within the context of religious Judaism (I have to add an exception for those few Jews at my church who are more accurately identified as “Hebrew Christians” religiously) and I’m not suggesting, Heaven forbid, that we divorce Judaism from Jewish people. It’s part of the ongoing dialog I have with my Pastor in terms of the continuance and validity of Torah observance for Jews after the destruction of Herod’s Temple and the Jewish expulsion from Israel by the Romans. But my Pastor brings up some very good points about exactly how halachah is to be observed since their is no single, overarching standard of behavior defined by the sages. Different Judaisms apply Talmud differently. The blogs I’ve written lately are my attempt at processing the information and questions I have on this topic and I have been inviting response from the Messianic Jewish community to help provide some perspective. So far, you’re the only Jewish person who has replied, although many have had the opportunity to do so. My personal opinion is that the full body is Jewish Torah observance and halachah are not binding or obligatory for the Gentile believer, but they remain so for the Jew based on the continuance of the Sinai covenant as it was extended by the New Covenant (see Jeremiah 31 and Ezekiel 36). If the Orthodox, Conservative, and Reform branches of Judaism each have their own interpretations and applications of halachah, then what defines the Messianic Jewish application? That is the core question behind what I’ve been writing here. Hi, James – The reason for any lack of “overarching standards” for halakhah is that the rabbinical system was designed to be more flexible than that, and dependent on each generation of rabbis to apply a set of common standards from common principles. That having been said, the standards are a bit less ambiguous in the orthodox realm, which is still the standard by which other modern streams of Judaism must measure themselves even insofar as they wish to diverge from them to accommodate some perceived modern situation. I will refrain from offering any comment about how well or poorly they may achieve their goals, and I will offer the observation that Judaism has preserved in its literature numerous behaviors that may be deemed more or less applicable or enforceable in any given generation but that may be revived when appropriate. I have the greatest sympathy for the Jewish Christians in your church, though I would try to persuade them that the Hebrew-Christian model developed a century ago was a temporary accommodation whose purpose has passed, and that their well-being as Jews and contributors to the Jewish enterprise would be better served otherwise. History has shown that they will not survive as Jews in a Christian environment, certainly their children or grandchildren will not, and that they are contributing to the alienation of their Jewish families from the Messiah. If they have been mis-taught that these considerations are unimportant, I can only lament their loss. The modern Reform and Conservative streams (not to neglect Reconstructionism and others) were formulated in response to historical circumstances, and modern MJ is still grappling with a selection of halakhot that meets its needs. One of these needs or desires is to somehow reclaim a first- or second-century CE outlook, while recognizing all the subsequent influences that have affected halakhic development so as to integrate as much of Jewish tradition as may be possible and applicable into our current circumstances. I suppose that characterizes them somewhere within the Conservative spectrum. At issue is not a “doing of religion” so much as the development of a lifestyle that incorporates and illustrates millennia of Jewish civilization. It is a practical corporate educational exercise that promotes the preservation of the Jewish people and our characteristic knowledge base that is still indispensible to understanding Rav Yeshua’s and Rav Shaul’s teachings. It remains to be seen whether the modern streams of Judaism will also become increasingly anachronistic, or if some of their insights may continue to be preserved. What is currently called Reform Judaism has become quite different from its origins, especially since the Holocaust and the resurgence of Israel, though it has not yet embraced halakhah. Conservative Judaism has always applied halakhah, though it tries to adjust it to modern circumstances. On the other hand, so does modern Orthodoxy, though with a stronger emphasis on maintaining historical connectivity. Acts 15 is quite clear that the full body of Torah mitzvot is not incumbent upon non-Jews, though it was still recommended that they learn Torah in synagogues each Shabbat. This does carry some implications about what may be permitted for the more mature non-Jew to do voluntarily and without obligation, for all the extra merit that the rabbis assigned to non-Jews who pursue Torah even though it is not their obligation (based on Is.56, among other passages). Of course, Rav Shaul re-inforced en-passant in Gal.5:3 his view that Torah is fully binding upon Jews and circumcised proselytes (i.e., converts). In his time it was also especially important to emphasize to non-Jews not to allow coercive social forces to deprive them of that potential for extra merit by becoming circumcised, which is how the Acts 15 halakhah came to be formulated. ProclaimLiberty, I acknowledge Yeshua’s teaching that our righteousness must exceed the scribes and pharisees and that those who keep and teach the commandments will be “great” with those who break and teach to break the commandments will be “least” in the Kingdom. Where is that commandment in the Law of Moses? Who gets to live? Those who hear “my son” the Shepard of the sheep. What do those who hear do? Follow the one who’s voice they know. I don’t condemn anyone but I do know who is condemned. Those who refuse to hear, believe and follow the only son of G-d.
ProclaimLiberty (may I call you “PL” for short? ), I appreciate you giving me a “in a nutshell” encapsulation that responds well to my questions. MJ is still grappling with a selection of halakhot that meets its needs. One of these needs or desires is to somehow reclaim a first- or second-century CE outlook, while recognizing all the subsequent influences that have affected halakhic development so as to integrate as much of Jewish tradition as may be possible and applicable into our current circumstances. And this is my struggle when trying to explain my limited understanding of MJ and Jewish tradition and how it all folds together to result in Jewish identity (see the “extra meditation” I posted less than an hour ago). My Pastor’s question, as I understand it, is if the Bible is supposed to the the final word of God and halachah is flexible across generations and across different branches of Judaism, how can MJ choose a particular tradition, knowing that it’s a human choice, and still acknowledge the sovereignty of the Bible? One answer would be to assume that God would allow a flexible halachah for the Jewish people and that being Messianic doesn’t complicate the issue, but that’s just my opinion and I can’t back it up. In Judaism, the opinion of the sages is sufficient to settle many matters, but in Christianity, the Bible has the last say, so it’s difficult to make the Christian and the Jewish way of understanding things live, work, and play together, so to speak. Most of the time, we don’t have to do that, but since Messianic Judaism as a significant overlap into the Christian world, thanks to us sharing the same Messiah, these questions are inevitable. As far as recapturing “a first- or second-century CE outlook,” we are limited by the Biblical and historical record, so a complete model is lost to us. As far as I’m able to discover, there is evidence that Jesus not only accepted the authority of the Judaisms of his day to establish binding halachah, but he observed significant (but not all) portions as well. The question then becomes, how he’ll respond to the modern incarnations thereof. “PL” is just fine; abbreviations of that sort are de-riguer after a few exchanges. Halakhah is the human response in the conversation with HaShem that begins with His Torah instructions. It is a re-iterated conversation that continues throughout our generations, so of course it is varied and flexible. 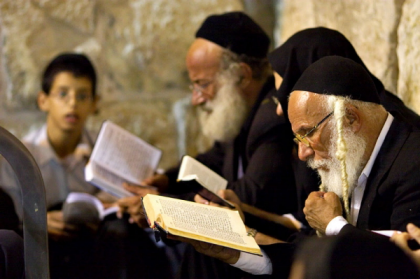 Judaism is not constrained by a concept of “the Bible as the final sovereign word of G-d”. We view a hierarchy that begins with the Torah above all, followed by the authoritative interpretations of Torah from Israel’s appointed leaders and teachers, in the Torah-defined role of the “shoftim v’shotrim” (judges and magistrates). The Prophets decry failures to live up to the standards of Torah, but they do not contribute to any new interpretation of it. The Writings provide additional illustrations of how this plays out in history or even in hypothetical scenarios (as some might view some of the literature). The inter-testamental apocryphal writings take that farther, including some material that could be viewed virtually as “fantasy” (since it was a bit too early in history to consider science fiction), though even that period included historical records such as the Maccabbean revolt and the miracle of Hanukah. Subsequent to that we have a variety of Rabbinic literature and Responsa, of which the Rav Yeshua messianic writings are a fitting example, though a bit earlier than other Rabbinic codifications. So MJ is not required to choose a particular stream of tradition, though most of its current contributors to halakhic formulation have been influenced by the Conservative movement and its particular flexibility. The only “complication” for messianists is the desire to integrate the views of Rav Yeshua and Rav Shaul into their compilation of halakhah for a Jewish community that honors them at least as well as other rabbinic views are honored. Since there is not really any incompatibility here for the discerning halakhist, that need not present difficulty or disconnection from other halakhic compilations in other Jewish streams. As to the difficulty of recapturing the 1rst-2nd-century worldview, more data seems to become available continually, but it is fair to say that MJ has devoted more attention to this than any other form of Judaism has done, because of its need to understand the teaching context of its primary rabbis. But from a modern halakhic standpoint, the issue is somewhat moot because of all that has happened in the past two millennia. So “… when [he] comes, will he find faith in the earth? (Luke 18:8). The linguistics of this also allow a more narrow colloquial reading asking whether he will find those who trust him in the land of Israel. Will he have any difficulty recognizing his sheep, either because of their halakhah or in spite of it? As long as MJ halakhists keep this question in mind, I’m reasonably confident of a positive response. There is a midrash that depicts Moshe Rabbeinu as being carried by an angel across time and space to visit the Jewish Talmudic Academy of Babylon. He is terribly perplexed by the argumentation, of which he cannot make any sense. He is then consoled by its reference to the Mishnah and its quotation of the words of Torah from the mouth of Moshe. Now, while we know nothing of the conversation that occurred on the “Mount of Transfiguration” between Rav Yeshua, Moshe, and Eliahu, in some future midrashic conversation Moshe might council Rav Yeshua to be patient with his modern disciples for exactly similar reasons. And we would be similarly well advised. Perhaps the one greatest thing that I’ve picked up in looking into Judaism, Jewish Roots, Hebrew Roots, Messianic Judaism, etc.. was in regards to Sabbath. I may be “way off”, but it seems that there is a belief (that’s covered in the Bible as well) that “life” must trump inactivity for Sabbath. How far that could be taken is what’s in question, did the disciples really need to “eat the grain that they’d plucked”? we’re they at risk of “starving to death”? Also to me as a Gentile Christian when Christ said that the Sabbath was made for man, not man for the Sabbath I believe we see that it’s supposed to be honor to God in rest & worship, not burdensome. I’ve personally never thought that the Sabbath was “done away with” & always felt (even before becoming a Christian) that the Sabbath needed to be honored.. But what “honor or recognition” defined as respecting was unknown to me other than “God’s day”. James, I enjoy your writings. thoughts, & insights, it is unfortunate that sometimes people can be impolite, confrontational, and even insulting in response. I strongly get a vibe from all of your stuff that I’ve read that you are NOT saying “this is fact” it is more of a “these are my thoughts / opinions based on what I’ve seen, learned, & observed thus far, more knowledge and insight might change things.” I greatly admire & appreciate your openness, honesty, and humility. Blessings! @JimmBacon — I think your basic instincts there are correct, but the halakhic issues in that vignette are much more subtle than life or death. This story does serve Matthew’s purpose, however, of showing Rav Yeshua’s engagement with Pharisaic discussion of halakhah in that period of its development. There isn’t space here to indicate all these issues, but I can summarize that one may use halakhah to be helpful and to expand human liberty, or one may use it to argue for its constraint. There was nothing halakhically wrong with what the disciples did, though this particular group of Pharisees was promulgating a constraining view for the sake of making a negative accusation. One may read Rav Yeshua’s response to them as somewhat sharp and ironic, directed at their attitude and motivation moreso than at their reasoning. This explains the somewhat blunt statement about the Sabbath being created for Man rather than vice versa. As you correctly surmised, it was not intended as contrary to the Torah’s instructions about Shabbat, nor even against the Oral Torah’s interpretations about how to honor it. But the subtleties of the discussion are not visible from the surface, though Matthew’s audience of the period was quite capable of recognizing them (and, incidentally, so was the modern rabbi from whom I heard the analysis). I strongly get a vibe from all of your stuff that I’ve read that you are NOT saying “this is fact” it is more of a “these are my thoughts / opinions based on what I’ve seen, learned, & observed thus far, more knowledge and insight might change things.” I greatly admire & appreciate your openness, honesty, and humility. Blessings! That pretty much sums it up, Jimm. I mean, what do I know? I realize that I know a few things, but there is a certain “fluidity” to our understanding of the Bible based on our theology and how we let it drive our interpretation and application of God’s word. I know we have to grasp some firm absolutes, but for the most part, a life of faith is a life of discovery, change, and growth. If we ever reach a point where we think we know it all and God can’t surprise us anymore, we’re probably ready to become extinct as believers and disciples. PL: That certainly seems to clarify the Jewish viewpoint on the relationship between Torah/Bible and the “authoritative interpretations of Torah from Israel’s appointed leaders and teachers.” I don’t doubt that most of traditional Protestant Christianity will balk, since Christian tradition doesn’t (formally, at least) allow for tradition to modify or add details to “the Word of God” (although this gets complicated since one’s theology always modifies and adds details to how we translate and interpret the Bible). I may have to take specific quotes from your comments in this conversation to form a new blog post which presents your summaries so readers of this blog will have better access to the information (not everyone follows comments on every blog post).